Hanns Walter Kornblum's "Wunder der Schopfung" ("Our Heavenly Bodies", 1925) is one of the first films to represent knowledge about the universe on screen. Essentially an illustrated astronomy lecture in the form of a special effects-filled German silent film, "Wunder der Schopfung" is a feast for the eyes. It covers a wide range of topics over the course of its 92 minutes, from the history of astronomy to an imaginary exploration of the solar system and beyond by spaceship, from faster-than-light travel to Einstein's Theory of Relativity. Though science has made innumerable new discoveries and disproved faulty theories the film is, even now, surprisingly relevant, entertaining, and informative. 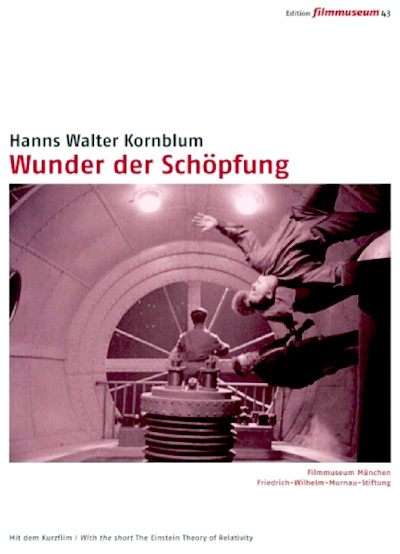 Using all manner of special effects, especially myriad forms of animation, Wunder der Schopfung is an amazing cinematic accomplishment, comparing favorably to contemporary fiction films like Fritz Lang's "Metropolis" and Harry Hoyt/Willis O'Brien's "The Lost World". "The Einstein Theory of Relativity" (1923), utilizing an American print from the George Eastman House with English inter-titles (with optional German narration), runs 29 minutes and has much the same appeal. It takes highly complex concepts and through visual examples makes them understandable. It's a fascinating little film. Never heard of this but it looks like it's right up my street! Many thanks again!